Being in-shape and being prepared to play are two very different things. Athletes usually get injured during pre-season practices because they are not prescribed a proper sport specific conditioning program. In other words, their bodies are not prepared properly for the demands of their sport. At “Get The Edge”, the objective of our conditioning program is to improve performance, enhance injury prevention and prepare the athletes energy system for the sport they play. I believe all high school age athletes, regardless of their sport, need to address basic flexibility, strength, speed and power needs. However, when it comes to conditioning, sport specific programs should be prescribed. The goal is to build a solid conditioning base while maintaining proper sprint motor patterns. This means we never jog. Athletes perform fast stride runs. This requires the athlete to run at approximately eighty percent of their sprinting speed covering distances between 60 & 100 yards. We then progress to timed shuttle runs. Shuttle runs cover distances between 60 & 150 yards and involve three key injury-prevention features: acceleration, deceleration and change of direction. Since most injuries occur during the deceleration phase of movement, incorporating change of direction into conditioning is extremely beneficial. The conditioning becomes more sport specific. Here we perform conditioning drills specific to the athletes sport work to rest time interval and movement patterns. To better understand this, let’s look at Football and Soccer. Football is a series of maximal efforts lasting 4–8 seconds in duration followed by a rest interval of anywhere between 10–60 seconds. This is an average of a 1:4 work to rest ratio. Many teams run a “hurry up” offense which decreases the rest time between plays. 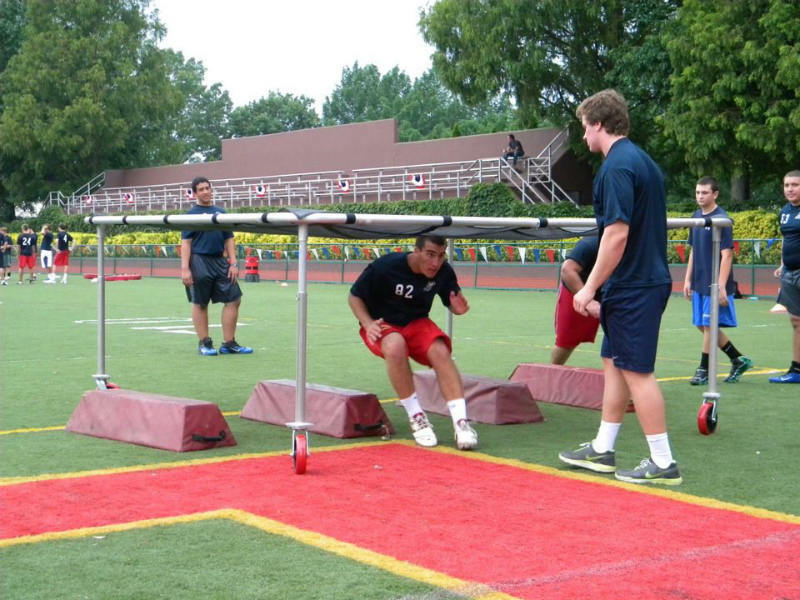 Football athletes perform conditioning drills based on the information above. Each drill will last approximately 5-10 sec. with 30-40 sec. rest. The Drills progress to mimic the specific patterns of each position while reacting to a visual que. Soccer, with regards to the work to rest ratio, is not as predictable. During a 90 minute match players stand, walk, jog, stride, and sprint at different intervals. Research shows that players will change direction up to 1,400 times in one game. Conditioning for our soccer athletes consists of shuttle runs that range from 50-300 yards. The Drills progress to mimic the specific patterns of each position using a wide variety of work to rest timed intervals. During the month of July, athletes usually have team practices (clinics) two-three times per week. They will also be attending college recruiting camps, and participating in club baseball, basketball and/or lacrosse leagues. These athletes need a proper balance of rest and work. Athletes in our program will participate in conditioning work customized for their summer schedule. At Get The Edge, we communicate with our summer multi-sport athletes to make sure we prescribe the correct dosage of conditioning.